Heavyweight contender Tyson Fury is a polarising character indeed. Fond of antagonistic commentary leading up to, during, and after a fight, not to mention being partial to a bit of abusive chat on Twitter or Facebook, the 6’9’’ giant from Manchester isn’t at all bothered about upsetting fans or fellow boxers in the slightest. To many this makes him an entertaining and colourful character, bringing an element of theatre to the “big-man” division, which has been longing for such a shot of adrenaline in many people’s eyes. To others, he comes across as arrogant and unruly, rude and obnoxious, with little or no respect for his opponents or for the sport in general. His hilarious and well publicised outbursts, particularly alluding to his self-proclaimed status as “the best boxer on the planet,” only serve to stir up more animosity towards him. After a poor 2013-14 saw him step in the ring only three times (due to lots of issues we shan’t go into now), 2015 sees the very real possibility of Fury stepping in the squared circle against one of the current Heavyweight title-holders. Although Wladimir Klitschko looks unlikely as an opponent for the near future, due to Klitschko apparently preferring to put an end to Shannon Briggs’ provocative antics that have continued for well over a year. Fury faces-off against Christian Hammer on the 28th of this month in the O2 Arena, London, in a bout he is expected to win. Following this, he plans to fight for a title; either Klitschko’s belts, or for Deontay Wilder’s newly acquired WBC strap. His WBO mandatory position has been worked for, and despite facing a few dangerous heavyweights, he is yet to square off against anyone considered a truly “top” fighter. I’ve watched Tyson Fury since his second paid contest. All along I’ve waited for things to step up a gear. Now at 23 fights, with zero losses, many people are still waiting to see things get interesting. A quick browse through Fury’s resume shows it to be lacking in any great, world-class opponents; the only name of real note in his conquests is Derek Chisora. Steve Cunningham was a decent Cruiserweight, sadly out of his depth at Heavyweight due to his punch-power never being any good, even below 200lbs. Journeyman Kevin “Kingpin” Johnson is the only other name on there that’s above domestic or European level. Although Fury finds himself in a position to challenge for a belt, realistically, what are his actual chances of winning a title? Even against the mediocre opposition he’s faced, Fury has struggled and made hard work out of ‘easy-on-paper’ fights. Beating up restaurant-owner Vinnie Maddalone was probably his most impressive looking win so far against an actual Heavyweight. With Wilder being a possibility for later this year, Fury would find himself in the ring with someone who matches–or betters him–in almost every department. Wilder certainly hits much harder. He is much faster. He has better fundamental skills. His chin is apparently OK after taking some shots off Bermane Stiverne unscathed. He is leaner. He is only two inches shorter. In contrast, Fury has underwhelming power for a man of his size. His chin has always been suspect after being floored by much smaller men. His fundamental skills are somewhat lacking, despite his improved use of the jab. His speed is fair to middling. Fury does have heart in his favour, he certainly isn’t a quitter, at least we haven’t seen anything that would suggest so. On paper then, Wilder looks like the overwhelming favourite. So, as Fury is more hopeful about challenging as a WBO mandatory, what would his chances be against undisputed king “Dr. Steelhammer”? 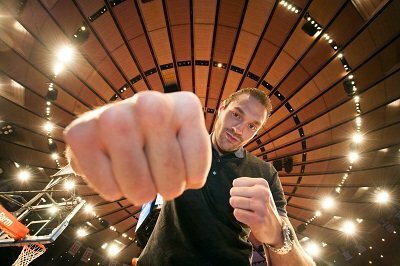 In terms of power, Wladimir wins, hands-down. Speed? Roughly the same. Size? Fury is taller by a few inches, although Klitschko utilises his size more effectively. Chin resilience? Again, they’re probably about equal in this department, but Wlad does a better job of protecting his. Ring craft? Love him or hate him, Klitschko has his technique down to a fine art, and can use ring-savvy to nullify his opponent’s strengths, breaking them down bit by bit before finishing them off; it may not be pretty but it is effective. Who has the biggest heart? They’re probably about equal on that front too. Although if it became a fire-fight, Wlad would be happy to turn it into a grappling contest to secure the win. So, on paper, Klitschko looks like the winner also. But, the beauty of Heavyweight boxing is the ‘one-punch-can-end-it-all’ factor. You could never write Tyson Fury off due to his size alone. But in realistic terms, it’s hard to believe he will bring a belt home to the UK, at least not in 2015. Let’s see what happens.